He was not an unarmed African-American man killed by police. That was Oscar Grant. See, the first day Occupy Oakland moved in to Ogawa Plaza, the occupation began referring to Frank Ogawa Plaza as Oscar Grant Plaza instead. It’s been interesting to see how well its caught on. At first, blogs and news sources didn’t mention the name Oscar Grant Plaza without mentioning Frank Ogawa Plaza as well. 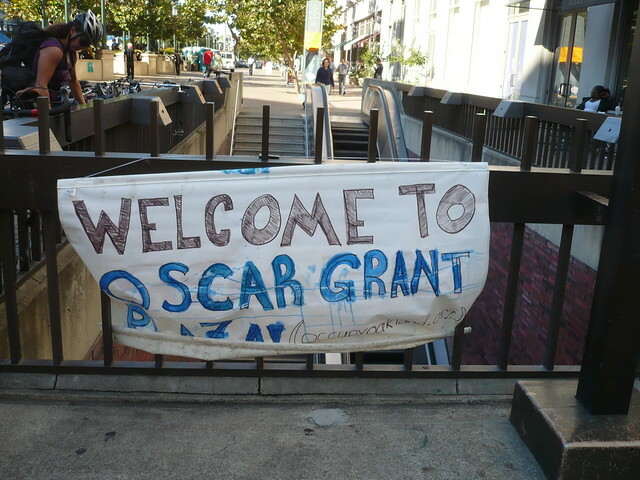 Then it was “Oscar Grant Plaza.” Now more and more media use the name Oscar Grant Plaza with explanation. Now it seems news sources from outside the Bay Area have accepted the new name, leading to the amusing confusion above. It is really cool to see such a clear example of making change just by pretending the change has happened. Too time consuming, bureaucratic and difficult to change the name of a public space? Don’t have elected officials that value the same people you do? Systematically excluded from the power networks of dominant society? Well, sometimes you don’t need them, you just need other people like you. I live in a world where that plaza is named in memory of Oscar Grant. Given that I work on the plaza, I’m thinking about reprinting my business cards. I’ve admired Sally Lieber ever since she came to speak in my Women in Politics class last semester. She spent time in junior high trying to dress more like Gloria Steinem, she got interested in politics while listening to the radio as she worked construction jobs, and she once spent time living as if she were homeless to gain an understanding of the homeless experience so she could write and advocate for the best possible policy. What’s not to admire? A few weeks ago I retweeted a Sac Bee editorial Lieber had tweeted about releasing non-violent female inmates from California prisons, putting them into “alternative custody” in their homes instead. It’s a really interesting idea to me. In fact, it was the subject of the first cost-benefit analysis memo assignment I ever did in my undergrad years. (It’s even more interesting to see its success — or lack there0f — now that it’s in place, but that’s a different post). And moments later I got a notice she’d started following me on Twitter. I know it’s just good form to reply to tweets and follow people who follow you when you’re maintaining a professional Twitter account. Nevertheless, it put a spring in my step for the rest of the day.